Siskiyou County, California has certainly earned its reputation as being one of the most productive areas for gold mining in the US. Lying at the heart of the famous “Northern Mines”, Siskiyou County has had over 370 gold mines in its history dating back to roughly 1850. Although the amount of gold discovered in Siskiyou County from roughly 1850 to 1880 is unknown because few accurate records were kept, the amount of gold removed from the county between 1880 iand 1959 is estimated to be at roughly 2 million troy ounces. Most of the active gold mines were shut down by 1959, but sporadic mining continues throughout this area still today. Every summer hearty gold miners work their way into the rugged countryside to pan the streams of this county in search of more gold. Although the amount of reported gold taken from this county is considerable, it is probably a low estimate. Most mining during the early gold rush was done by small-scale miners, and much of the gold that they found was never reported. This was common not only in Siskiyou County, but throughout all of California. Placer mining is the primary way that gold was taken from the area, but plenty of lode mines are found here as well. Other valuable metals recovered in Siskiyou County are a large group of platinum metal deposits as well. 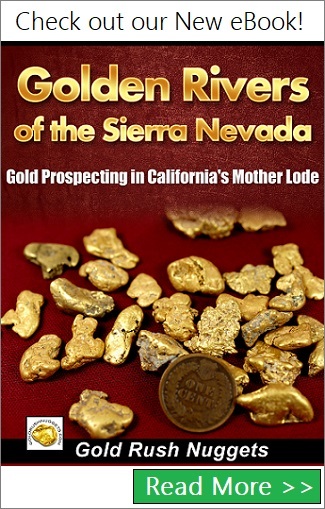 Although records are sketchy in terms of what was taken out of the mines in the first 30 years, it is known that gold was first discovered in the Yreka region in 1851. Within a few month, at least 2,000 miners pounced in the area looking for gold. These miners used a variety of methods to pull the gold from the river gravels, gulches and ancient benches. Many of the larger placer deposits were mined along the Klamath, Scott and Salmon River systems. In addition, there was a number of lode deposits scattered along many different areas as well, including the Salmon River, Yreka, Humbug, Fort Jones, Cottonwood and Cherry Creek regions. The eastern part of the county is loaded with Quaternary volcanic rocks and debris from ancient volcanoes. In addition, Pleistocene lake beds, patches of marine sandstone and alluvium dominate the area known as the Upper Cretaceous Chico Formation. This makes the eastern part of the country rough countryside with many streams that flow through which still contain gold deposits. The western part of the county contains many volcanic rocks which underlying inter-bedded sedimentary rocks are located from the Carboniferous and Devonian ages. However, during the late Jurassic period, these rocks were placed under enormous stress by the peridotite, gab-bro and granodiorite bodies which were introduced into the region. Interestingly enough, there is little in the way of fossils from marine life because during this time the land was an island and stayed well above sea level. Although the area has been searched hard for over 160 years, Siskiyou County still holds great potential for gold prospectors. There is undoubtedly some good gold still under the ground waiting to be unearthed.